Katherine graduated from the University of Kansas with a Bachelor of Arts in Communication Disorders. She went on to receive a Master of Arts in Speech-Language Pathology from the University of Kansas Medical Center. While she has worked with adults, treating aphasia in stroke victims, dysphagia, and providing memory care for those with Alzheimer’s– working with children is her true passion. The ability to communicate is a skill we often take for granted, but one that is so critical to everyday life and Katherine is enthusiastic about assisting those toward this goal. When Katherine moved to Chicago, she began working with children and their families through the Illinois Early Intervention (EI) program. 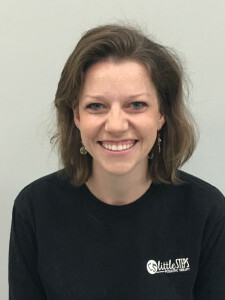 She is an Early Intervention credentialed speech-language pathologist. She is also a certified member of the American Speech-Language-Hearing Association (ASHA). expressive and receptive language disorders, autism, hearing deficits, and articulation disorders. She is trained to use PECS (picture exchange communicate system) and behavioral strategies to assist children in achieving their maximum potential. Katherine and her husband live in Glenview and have a son. In her spare time she enjoys exploring the food/culture of Chicago, spending time with family, and traveling.